Earlier this summer I stopped filling the birdfeeders for a while. The birds don't really need it in the summer time, and I was mostly only getting piggy starlings and grackles that would fling the seed at the feeders hither and yon, and pigeons on the ground to clean up after the grackles. When I did refill the feeders, I first used pure millet, then switched to "dove mix," millet, milo, wheat berries, oat groats and buckwheat; the sparrows and finches like it, but grackles and starlings do not. And I noticed that after I started filling the feeders again, I suddenly had a lot fewer cabbage white larvae in the garden. The birds like to hang out in the garden while they wait their turn at the feeder, and I guess they're picking up some protein snacks while they wait. However, I also noticed that when I filled the feeder that it would empty out overnight and that the next morning there would be more deer damage in the garden. They browsed my beet greens down to nubs, nibbled on my green beans and ate a lot of my chard, too. (Although it is worth noting that they only ate the row of chard that was planted between kale and peas, and did not touch the one by the tomatoes, so maybe there is something about the scent of tomato plants that turns them off.) I have a chicken wire fence to keep the bunnies out, but I really don't want to put up an ugly eight foot deer fence. So what I did was next time I filled the feeders, I spiked the seed heavily with chili powder. The next morning there were five fresh piles of deer poop around the yard, but the feeder was full and my plants were untouched. 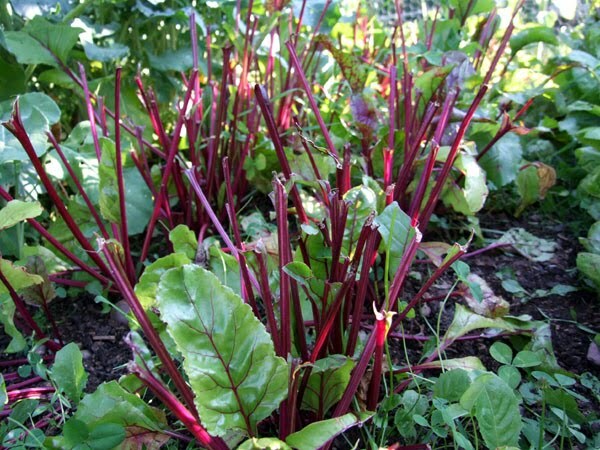 It is also worth noting that the beets and chard that they demolished were directly in the path of the birdfeeders, so perhaps they were mostly attracted to the seed and were just browsing some greenery while they were here. So now harmony is restored to the garden, or at least human-centric harmony. The deer are more than welcome to eat my hostas--in fact, they are encouraged to eat my hostas. Does anybody want some hostas? They came with the house, and I want to plant something more exciting there. Garden is producing relatively well. My Three Sisters Garden was poorly planned and over crowded, so the beans aren't doing as well as I'd hoped (getting browsed by deer didn't help either) and the broccoli also isn't producing much, but all my greens are lush and abundant (the chard grew back quite well) and there are plenty of beets and carrots. 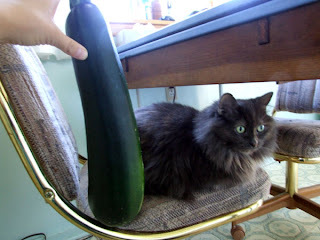 If I don't pay pay attention, the zucchini grow to assault-weapon size (see picture, with cat for scale) and I've got about 20 cups of shredded zucchini in the freezer for future bread and cake. I've also got about 10 cups frozen snap peas. My grape tomatoes are starting to come in, and I've got some volunteer tomatoes that are rather Sungold-esque, although actual Sungolds are a hybrid, so it seems unlikely that any seeds tucked away in my compost would have sprouted. All my larger tomatoes are still mostly green, except for a few Romas that are starting to turn. I've made two big batches of pesto so far, and there's plenty more basil left out there for more. Recently I dug my first new potatoes, tiny little fingerlings with papery skin, and for most of that week at least one meal a day included boiled fingerling potatoes with butter and salt. I bet if you posted free hostas at freecycle someone would come and dig them up. Hi Dad. That's the plan for later this fall, after their done blooming (they'll transplant better later in the season).